Sri Lanka Tuk tuk Rental service is provided by us throughout the Island. When you hire out one of our tuk tuk, you can be the driver and ride along with three of your friends in it. To rent a Tuk Tuk from us, you must fulfill some requirements first. You must have a valid local Driving License to drive a vehicle in your country. Be a healthy person without any disabilities. Pay a Re-fundable Deposit at our office and a passport copy of yours. We at Ceylontusker Tours, provide 24 Hour phone support, if you rent out a tuktuk from us. We will give you basic training on how to drive a Tuk Tuk. We will assist you to get a temporary local driving license for to drive our three wheel. You must respect the law of the land while driving or even walking. Reserve your tuktuk with us early. Mail us your passport copy and current local license that was issued in your own country. 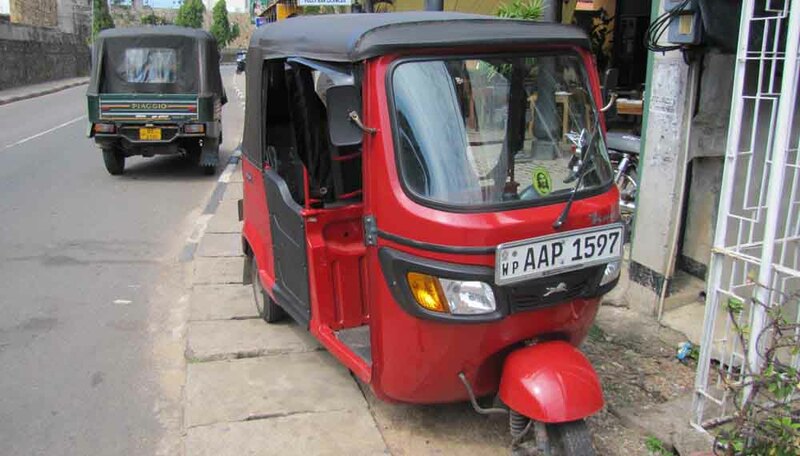 Our location: Negombo, we have tuk-tuk rental facility all over Sri Lanka. Get a Smartphone with data plan. Download and Install Google Map. Follow the route and go to places where you want. You are the boss and you are the driver. Go wherever you want at any time you want. You can meet local people, eat like Sri Lankan and enjoy the local life throughout your Holidays. Eat fresh fruits in the villages that are not available in star class hotels. Drink Green or king coconut as much as you want at affordable price all around the Tuktuk route. Our tuk-tuk's will make your holidays as a memorable one. Tuk Tuk (Three wheel. Local people call it as "Aato" ) Requirements. You are allowed to carry 3 persons only in the Tuktuk as per the Sri lanka Law. Self driving a tuk tuk is one of the cheapest and enjoyable ways when you are touring Sri Lanka. A tourist can get proper driving certificates here and can rent a three wheel for this purpose. Hiring a Tuk Tuk is cheaper with us, when you hire it more than 9 days. 06 - 09 Days hiring. Rate: US$ 18/Day. We provide discounted Special Rate for more than 9 days rental/hire. Popular Tuk Tuk colors are green, yellow, red, yellow and black. Head light with 4 signals, parking lights available. Some Tuktuk offers sound system too. Of course it is there. The gear control is available in the left hand side of the handle. Petrol stations are available all over Sri Lanka. The price are fixed by the Government per litter. No problem there are covers on both sides and wiper on the front windshield. All our tuk tuk vehicles (3 wheels) are provided with third party Sri Lanka insurance. Valid current year revenue License. Provided with perfect exhaust smoke certificate. Our company is just a phone call away from your tuk-tuk. Contact us now to get more information. I really enjoyed the trip in this small vehicle. No more waiting for bus or train. It is fun I recommend it for you. Great runs through cities and villages on our own. We stopped wherever e wanted to. Boy, it was cheaper than the normal packages. Chinthaka, I will never forget you. You gave me such an unforgettable experience on the road and locations. When in the country side, fresh air was blowing through my hair. So nice to be treated at road side coconut shops and Cadju shops. It is like donkey rides for tourists in Greece. I never thought about such an idea on a three wheel. Some time we were going safely at 50 Km/H. I want to get one to my home. Thank you Chinthaka, for providing me a fine three wheel touring experience in this beautiful land. It is worth for each penny I had spent.